Capa Mooty’s given name at birth is Catherine Cecil Person. She was born on the 13th of October 1970 in Dallas, Texas. Her nationality is American while her ethnicity is white. Not many details exist about this lady’s early life. As such, there is no information about her family background, potential siblings, or even educational history. With regard to her career, Capa Mooty is clearly a boss lady. She is the co-owner of a high-end mobile boutique known as Luxeliner. She co-founded the boutique with four of her friends who are also passionate about fashion. These entrepreneurial- minded ladies pulled resources together and bought a FedEx truck, which they painted over and transformed into a boutique-on-wheels. The boutique not only carries fashion articles but also gift items. Mooty and her friends hope to take the boutique to great heights. Capa Mooty is married to former NFL quarterback and Hall of Famer, Troy Aikman. Their love story commenced in February 2016 when they started dating. Even though we do not know the exact details of how they met, it is easy to see that these two are smitten with each other. Aikman, who is ordinarily secretive about his private life, often shares pictures of their date nights and hangouts together. Mooty and her beau got engaged on the 2nd of June 2017 in Lake Como, Italy. Aikman commemorated the engagement with a picture on Instagram. He described the day as a special day and described Mooty as the love of his life. Mooty and Aikman tied the knot on the 4th of September 2017 on a beach outside Biltmore Four Seasons Hotel, Montecito, California. 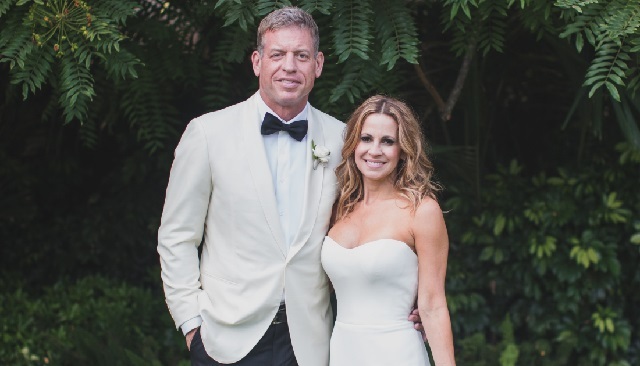 Aikman looked dashing in a white tux while Mooty wore a beautiful strapless white gown. The beautiful but private ceremony was witnessed by a few friends and family. Amongst them was the couple’s children from previous marriages. Mooty and her husband, as well as their blended family, are based in Dallas, Texas. Capa Mooty and her beau have both been previously married to other people. Mooty was previously married to Jerry Mooty. Jerry Mooty is a lawyer and also the nephew of Dallas Cowboys owner, Jerry Jones. The marriage produced two sons, Luke and Val, and they divorced in 2013. On the other hand, Troy Aikman was previously married to Rhonda Worthey. Before that marriage, he had previously dated personalities such as actress Sandra Bullock and country singer, Lorrie Morgan. Aikman and Rhonda got married on the 8th of April 2000. At the time, Rhonda Worthey worked as a publicist for the Dallas Cowboys. The marriage produced two daughters Jordan Ashley (born on the 24th of August 2001) and Alexa Marie (born on the 30th of June 2002). Aikman and Rhonda separated in January 2011 and divorced in April of that same year. Capa Mooty’s net worth is not yet available as it is still under review. However, it is safe to assume that she rakes in a decent sum from her mobile boutique, Luxeliner. On the other hand, her legally married husband, Troy Aikman has a fortune estimated at $25 million. Aikman made his money from his successful football career. He did not only earn his wealth from the hefty contacts he signed but also from juicy endorsement deals. At a point in his career, he was the highest paid player in the NFL. Since retiring in 2001, Aikman has gone on to establish a successful career as a sportscaster. He is Fox Network’s leading NFL analyst, and the job reportedly brings him a million dollars each year.